You know those activities you plan to do with your kids, but never seem to get to them? Well, flying kites used to be one of those activities for us. It seems like we talked and talked about it, but never got around to it. Until last Saturday. 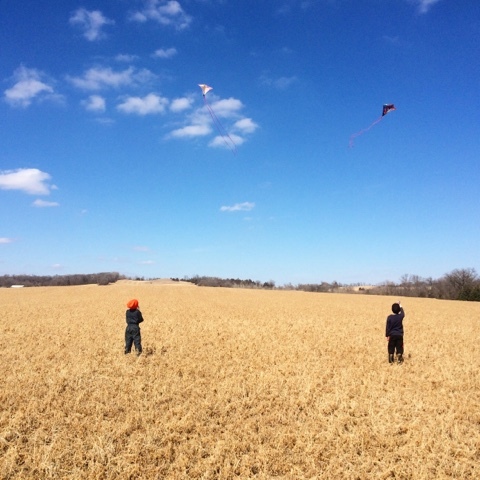 The sun was shining, there was an incredible south wind, and we actually had kites because Glen reminded me to pick some up last time I was at the store. It took a couple minutes for Dan and Monika to figure out how their kites worked, but once they got the hang of it, we had a lot of fun. Good, old-fashioned, unplugged fun. Until their hands got too cold because they forgot their gloves in their excitement. I'm not opposed to electronic fun, but I'd much rather see my kids enjoying the activities life on a farm has to offer. Maybe the charger will show up when the snow flies again next fall. 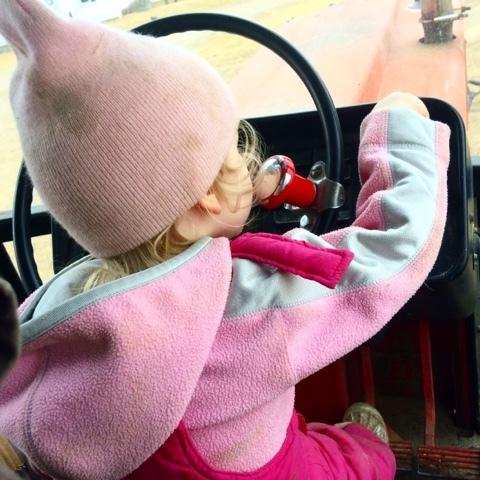 Daphne's favorite place to be now that it has warmed up some is in the tractor with Grandpa or in the skid loader with Dad. And she's quickly learning how to operate both machines. If you look close in the picture, you can see that she's got one hand on the steering wheel and one hand on the throttle; one foot is on the brake, and the other is on the clutch. I'm sure I'll blink and she'll be driving the tractor for real. Our pigs arrived this week. (We actually got four pigs, but the fourth one wouldn't pose for the picture.) After not getting pigs last year, their arrival generated much excitement. Daphne climbed right into the hutch with the pigs when they first got here. It's so adorable to hear her say pig in her little toddler voice. Dan and Monika and their cousins played in the hutch with the pigs for nearly an hour the other day. Monika thinks the pigs are "just too cute" and Dan wants to know if we can get a saddle for a pig so he ride them when they get bigger. I'm excited to have pigs again, too. I like their antics and the entertainment they provide. 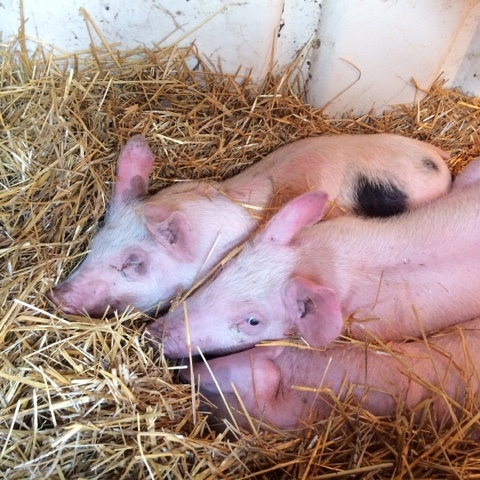 It's super fun when we get gentle ones, like these pigs, that let the kids play with them. We have a lot of baby calves right now and a whole bunch of them haven't graduated to the calf feeder yet. 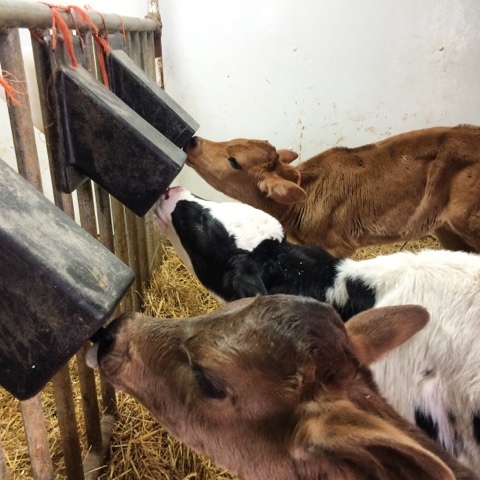 We house our newborn heifer calves in groups and bottle feed them for 10 to 14 days before moving them into the pen with the automatic calf feeder. During those two weeks, we train them to drink independently using bottle holders. And, I tell you, these bottle holders are the best. I would have lost my sanity a long time ago without them. We use them in the group pens (tied on with twine string, so we can move them as needed) and for the bull calves in hutches (secured to the cattle panels with zip ties). I have one kid who wants to eat only pasta and potatoes, one kid who wants to eat only meat, one kid who eats everything, and a hard-working husband who just wants something to eat. Finding meals that please everyone, while still meeting my nutrition goals, can be challenging. So when I find those meals that make everyone smile, it’s kind of like winning the lottery – and sometimes the odds really do feel like one in a million. 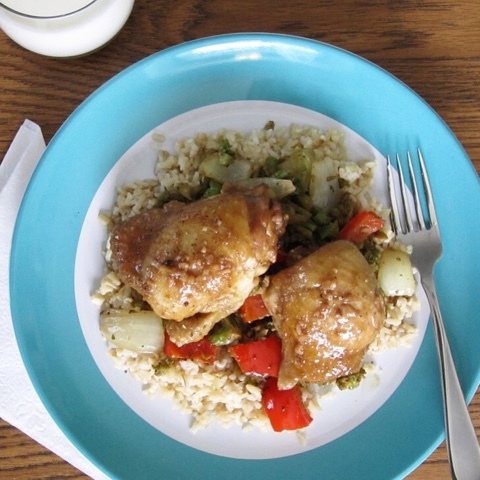 Ultra-Tender Teriyaki Chicken, paired with brown rice and oven-roasted teriyaki vegetables, is one of those winning meals. The first time I made it, there wasn’t a single piece of chicken left to save for tomorrow’s lunch. I have to say, though, that when I found the recipe that inspired my Ultra-Tender Teriyaki Chicken, I was a little intimidated by the two-step cooking process. But then I thought, I can do this, it’s not that hard. And I was right. This cooking method is really pretty simple and the results are phenomenal. Ultra-Tender Teriyaki Chicken is so tender and so full of flavor; I seriously believe it’s the best chicken you’ll ever eat. To me, that’s what Land O’Lakes’ Kitchen Conversations are all about – inspiring confidence in the kitchen. I can definitely say that participating in Kitchen Conversations has made me a more confident and adventurous cook. I am simply thrilled to be participating again this year. I’m also extremely proud that this first conversation is centered around Land O’Lakes’ Pin A Meal. Give A Meal. campaign. As a farmer-owner of the Land O’Lakes cooperative, I believe giving back to our local communities is incredibly important. Food insecurity is a problem many of us don’t think about, but, according to Feeding America, one in six Americans faces food insecurity. Nearly 16 million of those challenged by hunger are children. You can help Land O’Lakes reach its goal of donating 3.5 million meals to hungry families in need of nourishment. By pinning my Ultra-Tender Teriyaki Chicken, or another recipe of your choice, you will contribute 10 meals to Feeding America. And to provide even more meals, simply pin additional recipes from Land O'Lakes. Use the hashtag #pinameal on Pinterest and other social media to help spread awareness and give hungry families hope. To learn more, visit www.landolakes.com/pinameal. Just think of all the smiles that will come from those 3.5 million meals. I hope my recipe for Ultra-Tender Teriyaki Chicken puts smiles on the faces of those you cook for, too. In a large (8-quart) dutch oven or stock pot, combine chicken, water, onion, 2 tablespoons garlic and gingerroot. Bring water to a boil, cover pot, reduce heat to low, and simmer for 15 minutes, turning chicken over after 10 minutes. While chicken is cooking, melt butter in a large (12-inch) pan over low heat. Once melted, remove from heat and stir in soy sauce, honey, brown sugar, 1 tablespoon garlic, vinegar, pepper and ground ginger. When chicken has cooked for 15 minutes, scoop out ½ cup of the onion-garlic broth, add to melted butter-soy sauce mixture in pan, and stir well. Then use a tongs or slotted spoon to transfer chicken pieces and onion slices to pan. 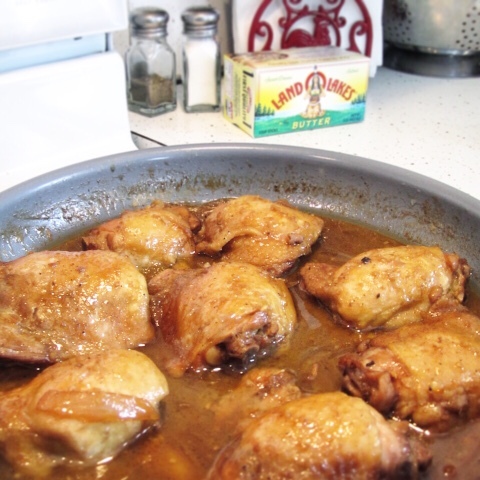 Place pan of chicken and sauce over medium-high heat, with lid propped on pan, and simmer for 10 minutes. Turn chicken pieces and simmer, uncovered, for 10 minutes more. 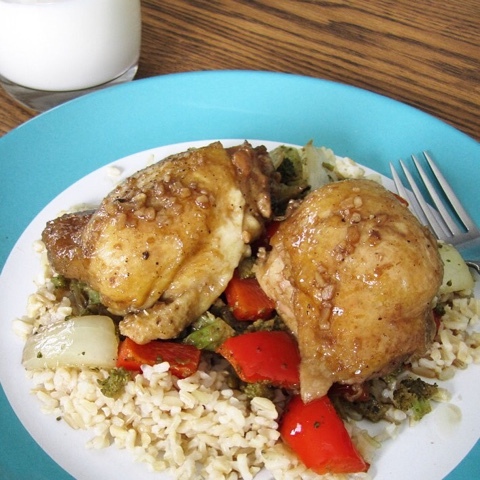 Recipe inspired by the Asian-Style Braised Chicken Drumsticks from MJ and Hungryman. *The Land O’Lakes Foundation will donate $1 to Feeding America® for every recipe pinned or repinned between March 2, 2015 and April 30, 2015. (Pin any Land O’Lakes recipe or submit any recipe pin at LandOLakes.com/pinameal). $1 helps provide 10 meals secured by Feeding America® on behalf of local member food banks. Land O’Lakes guarantees a minimum of 3.5 million meals (monetary equivalent of $350,000). I am a Land O'Lakes Cooperative member-owner. I received compensation from Land O'Lakes for this post. All opinions are my own.